I moved back to Melbourne last weekend and within only a few hours of being here, I was already convinced that it is the coolest city in the world. 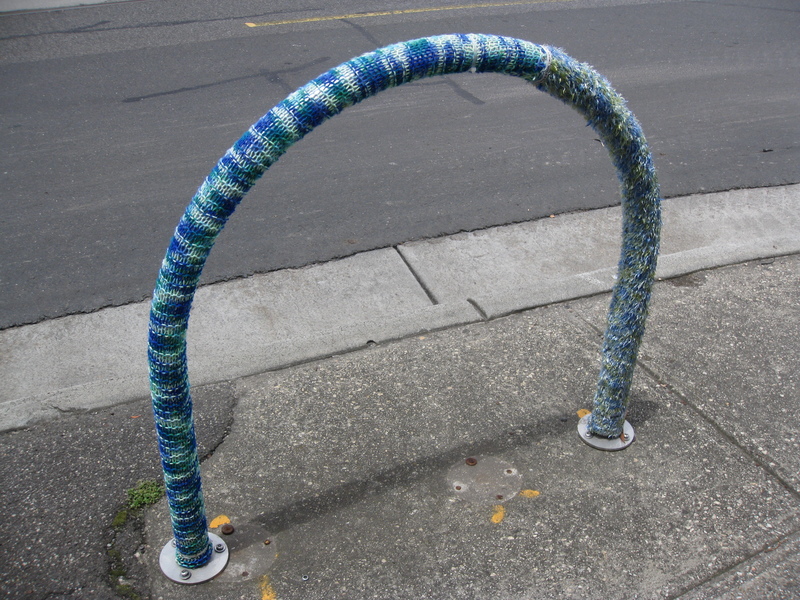 On the way to brunch with some friends we spotted a bike rack on Lygon St that had been yarn bombed. That is, someone had given it a lovely knitted cover. 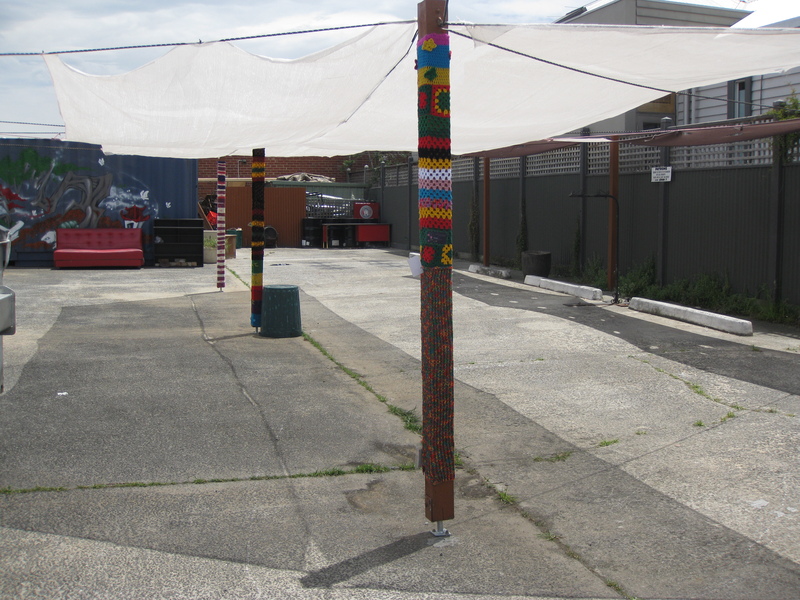 Yarn bombing is like graffiti, but in woollen form. 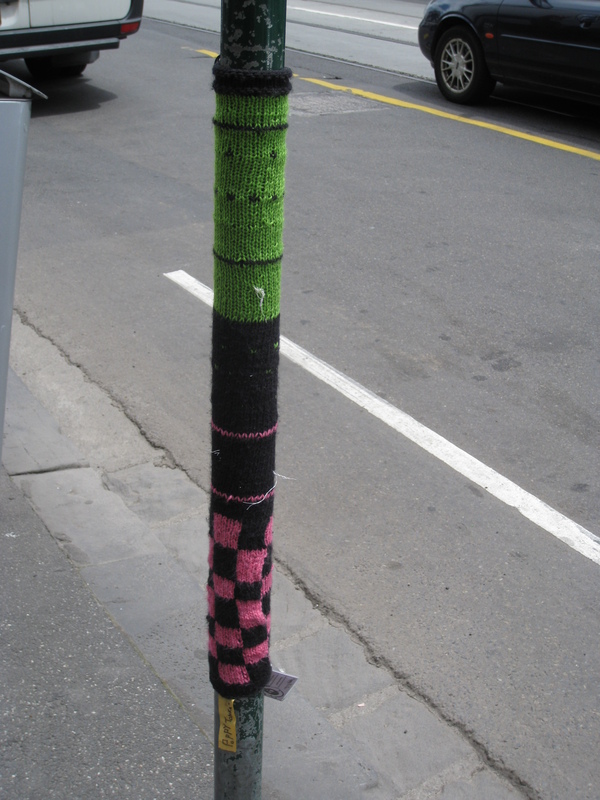 Some people consider this ‘guerrilla knitting’ to be vandalism, others street art. Personally, I think it’s beautiful. 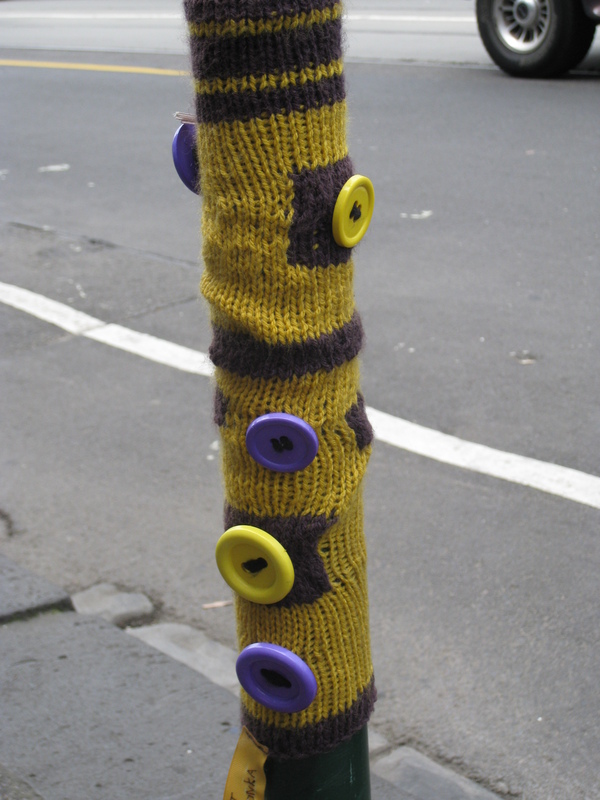 I would never buy a can of paint to spray a slogan on a wall, but I’m tempted to learn to knit so that I can make a woollen sleeve for a lamppost. Perhaps I’m underestimating the political power of yarn bombing, but it just doesn’t seem like a naughty or controversial thing to do in the way that spray painting a wall does. Don’t get me wrong, I like graffiti and I think a spray painted scrawl is just as much a work of art as an image by Banksy, but I can understand why some people dislike it and why councils have it removed. At its best it can be inspiring, challenging and attractive; at its worst it can be ugly, hate filled and offensive. Yarn bombing, well, it just looks nice, doesn’t it? What everyday object cannot be improved by dressing it in a cheerful knitted jacket? Over brunch in L’atelier de Monsieur Truffe (another one of Melbourne’s hidden cafés, where I had the most beautifully presented and delicious hotcakes ever), Grace, Anna and I decided to go on a yarn trail to discover more of the city’s knitted artworks. The following Tuesday we went for a walk around Brunswick where we discovered pieces by the Brunswick Bomber, Poppy Tonka and Yarn Corner, along with other untagged works. We started out at Charles Street Market then made our way up Sydney Road. It’s amazing how easy it is to miss these yarn bombed objects if you’ve not got your eyes peeled. Sometimes we walked past one two or three times before we spotted it. All in all, though, it was a successful trail with plenty of yarn bomb sightings. A few days later, Grace reported back that one of the knitted covers we’d seen on a bike rack in Charles Street had been removed. Only a fringed pink cuff remained. I wondered if the perpetrator was someone who disapproves of yarn bombing in general or who just objected to the combination of pink and teal stripes? Either way, the fact that someone was motivated enough to rip it off suggests that yarn bombing is perhaps more controversial than I initially suspected. I love yarn bombing! I work at a yarn shop and I would so love to start a campaign to yarn bomb my home town. Definitely learn to knit–even if you only know the basics you can make beautiful stuff (just did a post on basic knitting yesterday: http://spinsewsketch.wordpress.com/2011/12/02/101-elevated/). Great post! Recycled yarn! I hadn’t even thought about the environmental implications of yarn bombing. Perhaps it should be biodegradable yarn? I do love the idea of yarn bombing. That’s fantastic! 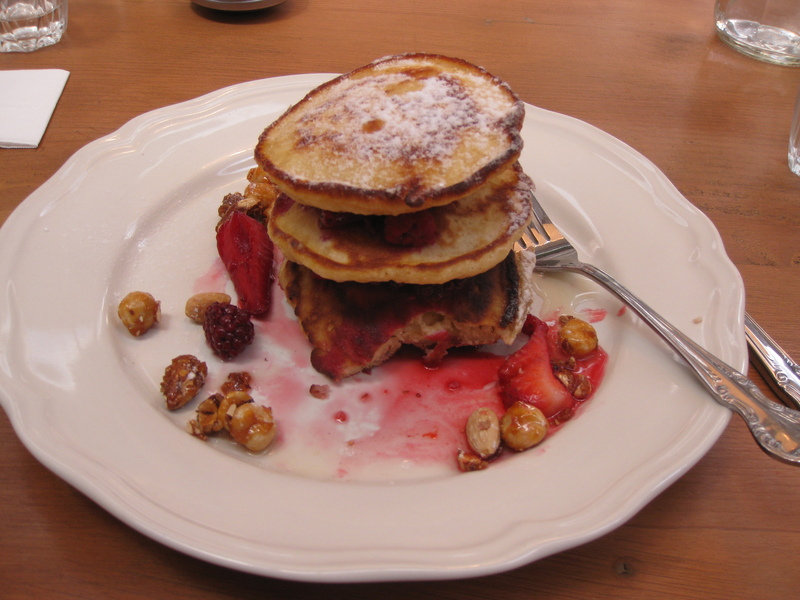 And those hotcakes look SO good. Mmm, yes they were delicious. I need to learn to make them myself! I like your photos – some lovely examples of yarn bombing there. i noticed an example in Edinburgh yesterday. It’s a nice form of creative expression and can really brighten a place up, but i don’t like the idea of yarm bombing trees (which I think some people do) because that must disrupt life for the plants and animals that live on the trees. I saw a tree here in Melbourne that was covered in a crotched doily type yarn bomb. At the time I thought it looked lovely, but I hadn’t really considered the disruption that would cause to plants and animals. That’s definitely something to think about for when I learn to knit and am able to drop my own yarn bombs. Helen, yesterday in Hasselt there were load of things that had been ´yarn bombed´ and how funny that today I read your blog about it! Is this a form of the universe providing?! My favourite was a metal cat, I will send you a picture. Hey Lucy, Yes, send me pictures! 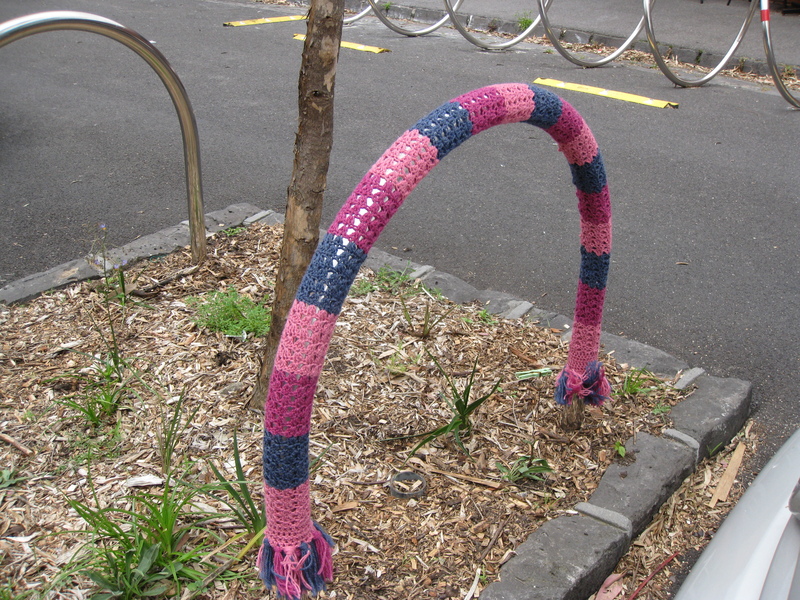 Obviously yarn bombing is becoming very widespread. You’ll have to look out for the ones in Edinburgh when you get back. I’ve never heard of yardbombing…. Just looking at those hotcakes makes me hungry!